Almost three years ago, I rode across Ukraine on my motorbike. A lot has changed since. I travelled through the Donbass region, spent two nights in Luhansk and crossed the border into Russia. This would be unthinkable today, the region has been ravaged by war and the border with Russia is sealed. I do not know when I will be able to visit the area again – soon, I hope, but might still be some time. Far from this conflict zone, to the north of the country, lurks another enemy that will take much, much longer to defeat. 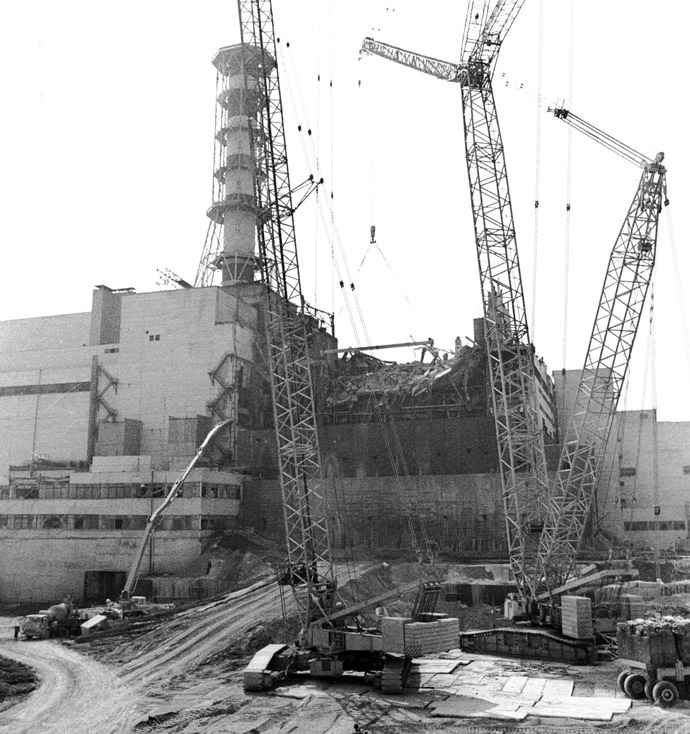 This week marks the 30th anniversary of the Chernobyl nuclear disaster. The night of 26th April, 1986, a fatal combination of human error and design faults led to the worst nuclear catastrophe in history. The story of the exact events that caused the explosion, despite being rather technical, has been told many times. The disintegration of the USSR and the difficulties in doing accurate research meant that less is known about the long term effects that the radioactive fallout had – whole areas rendered uninhabitable, displaced population, contaminated crops and water sources, an increase in several types of cancer, particularly thyroid, genetic disorders… in one way or another, the disaster directly affected the lives of at least 300,000 people. Unfortunately, as is often the case with disasters that seem to be far from us, the world has long turned its regard away from Chernobyl. 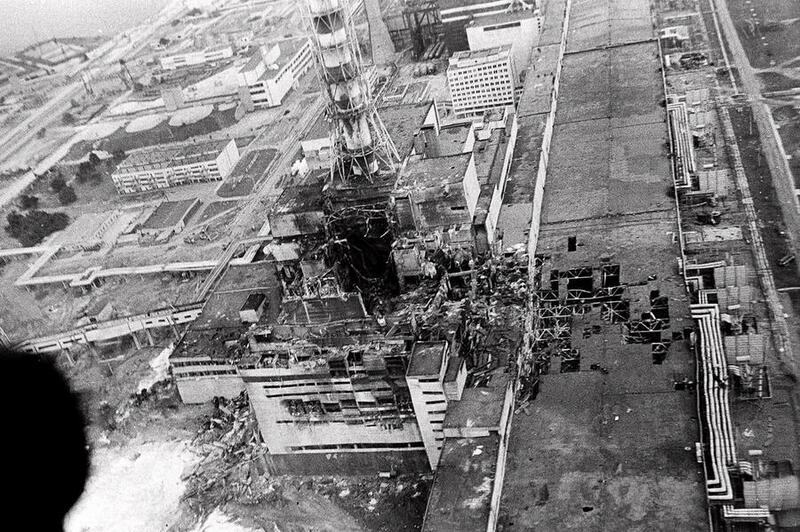 The area was put under military control, the remains of the reactor were sealed and we forgot about it. But the danger is far from over. 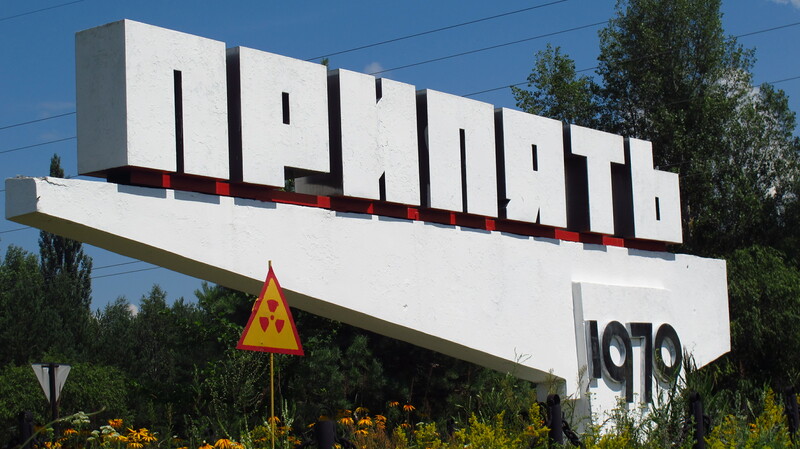 There are still 16 tonnes of uranium and plutonium inside the reactor, among many other radioactive materials. One milligram is enough to be lethal to a person. You do the math. 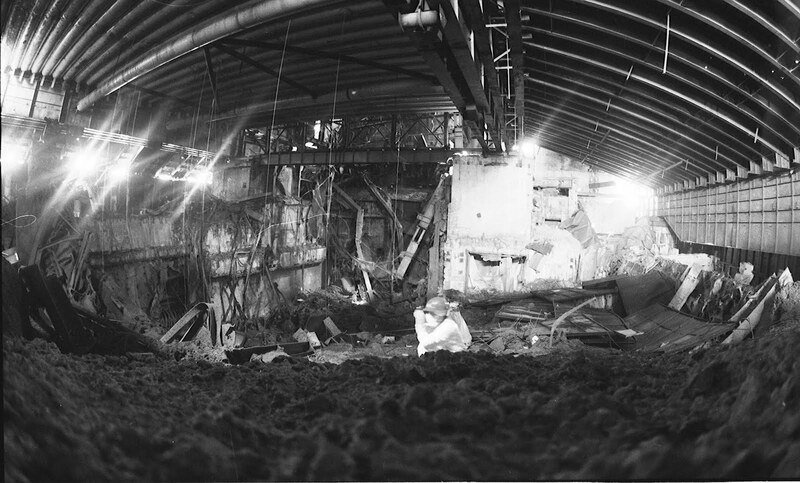 In the immediate aftermath of the accident, once the fire in the core had been put under control the main priority was to seal off the remains of the reactor to prevent the spread of radioactive dust and smoke into the atmosphere – remember that the extent of the catastrophe only became clear when the radioactive cloud reached Sweden and set off the alarms of a nuclear power plant there – but it was impossible to work near the building as radiation levels were high enough to kill a person in a matter of minutes and leave lethal long-term effects in a matter of seconds. Building a structure to seal a building that was not only enormous, but partially destroyed and surrounded by debris without approaching it more than it was strictly necessary was not an easy task. The area around it needed to be cleared to lay off the foundations to the structure, ways of putting the structure into place without endangering the lives or workers needed to be found, and everything needed to happen as soon as possible. Remote controlled bulldozers were used to clear the surrounding area. The debris and the first layer of soil were dug up and buried in deep trenches that were immediately covered in concrete. Most of the structure for the sarcophagus was built on remote sites and then transported and moved into position using enormous remote controlled cranes. The display of ingenuity and technology was staggering. Even so, building such structure remotely still posed high challenges. 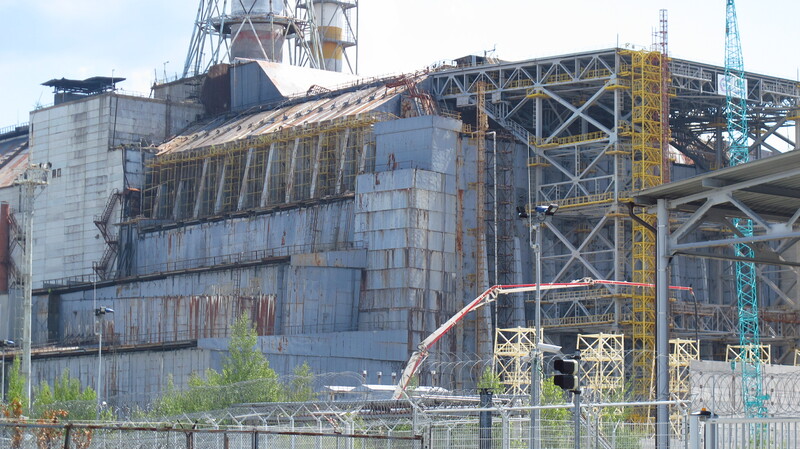 The roof structure rests not on newly built pillars or walls, but on remains of the ventilation shafts of the reactor, which were damaged in the explosion. 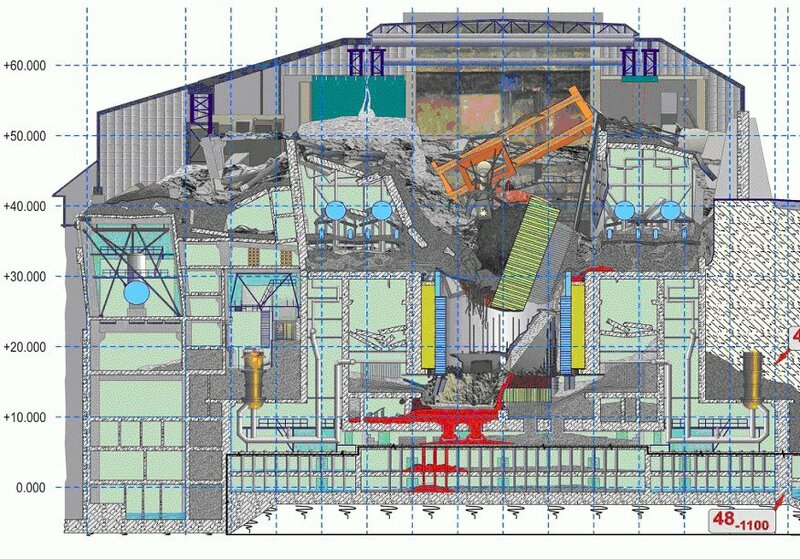 The 2000-tonne slab of concrete that covered the reactor fell into an unstable, almost vertical position; if it moved, it would stir up highly contaminated dust or damage the structure around it. The welding and riveting of the sarcophagus had to be done remotely, so they were not as accurate as it would be desirable, and on top of it all the whole structure has been suffering the effects of the harsh climate ever since. 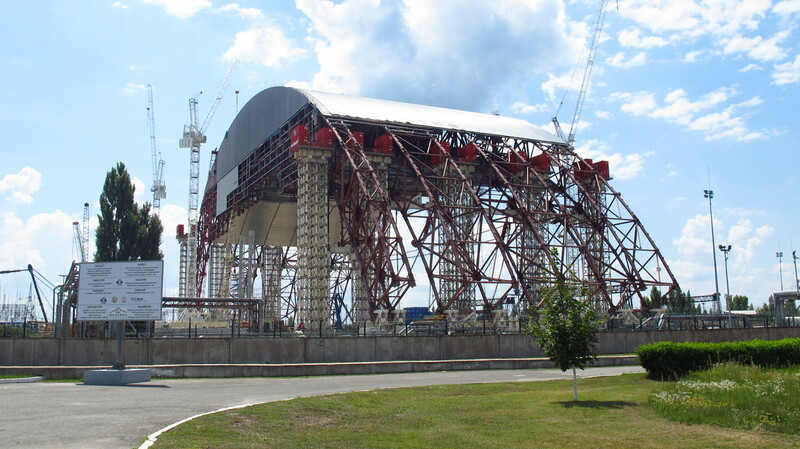 It was designed to last for thirty years and it was supposed to keep radiation levels low enough to allow work in the construction of a better, more permanent structure. However, the disintegration of the USSR meant that the problem was now in Ukraine territory, and neither Ukraine nor Russia had the money to undertake such operation. 10 years after construction ended, the structure showed cracks and gaping holes, and water was pouring in and leaking to subsoil. Radiation levels inside the sarcophagus were still very high and it was concluded that it would not be possible to repair it from the inside. As soon as 1992, the Ukranian government held an international competition for a design proposal of a structure to replace the existing one, but it was not until 2004 that the design was completed. The start of actual construction work on the site would have to wait another six years, until 2010. In 2006, the Designed Stabilisation Steel Structure, which had been built next to the western wall to relieve some of the roof’s weight off the damaged concrete wall on which it rests, was extended to support up to 50% of the load. 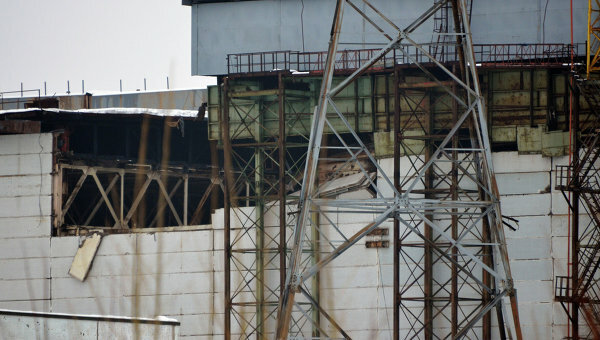 This was said to make the structure stable for another 15 years, but other parts of the sarcophagus were still unstable – in February 2013 part of the roof of the turbine hall collapsed, and workers had to be evacuated. The collapse was later attributed to poor quality repair work and deterioration of the structure. A 180 meters to the east of the construction site of the NSC, the old structure stood much taller than the photographs I had seen might lead to believe. We were only allowed there for a few minutes, but it was enough to appreciate how badly needed a new sarcophagus is. As I write these lines, construction of the NSC has been completed. All that remains now is for it to be moved into position and permanently sealed, 30 years after the catastrophe. This entry was posted in Stroming The World 2013, Travel and tagged Chernobyl, Luhansk, Prypyat by Kilian. Bookmark the permalink.